Sitting on a plastic stool, head bowed over a bowl of noodles listening to people chat, laugh and smoke – you can’t get a more down-to-earth Hong Kong experience than that. And if the sweat isn’t running down your back, then you’re not doing it right. But although dai pai dong embody the spirit of the city, this no-frills street food experience is under threat of extinction, say two young filmmakers. Joseph Angelakis and Chris Owen met at film school two years ago, and have graduated from the International Academy of Film and Television in Wan Chai. When their former mentor suggested they enter the National Geographic video competition, it didn’t take long to settle on a subject. The Nat Geo Awards challenged filmmakers to make a five-minute documentary that paid tribute to the people and stories that reflect the spirit of Hong Kong. “Dai pai dong seemed an obvious choice, as they embody the spirit of Hong Kong. We hope that people will watch this and realise that they are still around. If they like them, they should go and support them,” says Angelakis. The name dai pai dong means “restaurant with a big licence plate”, referring to the size of the licences, which are bigger than those of other licensed street vendors. There are only 25 dai pai dong left in Hong Kong: 11 in Sham Shui Po, 10 in Central, three in Wan Chai and one in Tai O, according to the Food and Environmental Hygiene Department, which manages the licences. The first licences were issued after the second world war to relatives of civil servants who had been killed or disabled in the war, allowing them to open small restaurants on the street and make a living. Dai pai dong reached their peak in the 1950s. They were about more than just offering a quick, cheap meal; they were a place for working people to gather and talk. They earned the nickname “poor people’s nightclub”, not because there was music or dancing, but because they were a place to socialise. This was in the days before public housing. But their popularity led to noise and traffic complaints, and in 1956, the government stopped issuing new licences, and prohibited the transfer of existing ones. In 1975, the first cooked food centre opened, beginning a process of trying to shift dai pai dong into a more controlled environment. In 1983, the government began to buy back licences, offering up to a few million dollars for each one to speed up the process of getting them off the street. As licences couldn’t be transferred, many elderly dai pai dong owners chose the cash option and numbers dropped sharply in the ’80s. Some districts lost all their old street side eateries. Kowloon City, which had been home to 68 dai pai dong, had none by 1984. The numbers have been shrinking elsewhere ever since. But it’s not all doom and gloom. It seems there is some room for manoeuvre, and the licensing regulations are not hard and fast, at least, in some districts. “In the hawker policy review a few years ago, it was decided that if the District Council agreed, there could be succession of the licence to the immediate family, such as a son or daughter,” says a senior inspector from the Food and Environmental Hygiene Department. The district that has benefited from this flexible approach is Central, where there have been at least two cases in which the District Council agreed to extend the licence and keep the dai pai dong operational, the inspector says. “Dai pai dong are traditional, and they are something that tourists want to see. So in Central, they have decided to keep them. Other districts may have other views,” he says. Central has also benefited from an assistance scheme to upgrade the stalls. Earlier this year, the government gave a HK$200,000 grant to restore 10 dai pai dong, with the intention of repairing their roofs and installing natural gas piping. Angelakis says the message he got from the Central dai pai dong owners was that tourists are their big hope for staying in business. These cooks are the unsung heroes of the dai pai dong, says Angelakis. They aren’t in it to get rich or famous. It’s a way of life, and a part of Hong Kong tradition that is slipping away. “The cook we spoke to doesn’t enjoy what he does, and he explained that the only enjoyment he gets is from drinking beer. But the dai pai dong is his life, and the only life he knows. It’s guys like him who are at the heart of it all,” says Angelakis, who did the voice-over for the film, as well as shooting and editing. Just as in the ’50s, the attraction of dai pai dong is more than just cheap food. The fun of sitting on the street, watching the world go by, is a big part of it. “If a tourist asks me what they should do to understand Hong Kong culture, I always say go to a dai pai dong,” says 24-year-old Owen, who works as a cinematographer for a corporate video company who has lived in Hong Kong since the age of two. “Nothing captures the spirit of Hong Kong like sitting at the table having a big meal surrounded by people. You’re sitting outside, too, between all the buildings, so it’s the real Hong Kong,” he says. Of course, dai pai dong are not places for those who demand strict hygiene. The pair spotted cockroaches and rat droppings while they were filming, but that hasn’t put Owen off his food. “I love the pork, that’s my favourite. Don’t go if you’re germ-phobic, although you’re not going to get sick eating there,” he says. Vincent Kwok has been visiting dai pai dong several times a week for more than 20 years. Early on, he came because it was all he could afford on his clerk’s salary. Now, as an office manager, he could splash out on a meal in an air-conditioned eatery. But he comes back because he enjoys the relaxed atmosphere and the banter. His favourite is Chan Sze Kee on Stanley Street in Central, where the lunchtime crowd is tightly packed around a cluster of tables. “There’s always someone I know here. It’s where I hang out. You can watch all the people going past, and you don’t have to leave the table when you want a cigarette,” says Kwok. There’s ashtrays on all the tables, beside the toothpicks and the chilli sauce. The menu is bilingual, in a bid to encourage expats and tourists. A waitresses dishes out bowls of noodles, rice, dumplings and white bread sandwiches on plastic plates. She has to shout to be heard over the diners. It’s the sizzling hot wok that gives dai pai dong cuisine its distinctive flavour, wok hei, which literally translates as “wok essence”. Above the cooker is a newish Towngas logo and the green awning over the eatery is in good shape. This is one of the fortunate dai pai dong, blessed by its prime location, so it stands a better chance than most of surviving. “Yes, this place is doing OK, but the government should do more to save the dai pai dong, especially the ones in other districts, on Kowloon side. If they go, we’ll lose our Hong Kong culture,” says Kwok. If tourists really are the answer to bolstering the flagging dai pai dong culture, perhaps the Hong Kong Tourism Board could do more to promote them. At present, its website dedicates three short paragraphs to dai pai dong; a more detailed description of their history, the food they offer and a map of where to find the remaining 25 could go a long way to ensuring their survival. Angelakis and Owen’s entry didn’t win a Nat Geo award, but that hasn’t dampened their spirits. The pair say they’ve had a lot of feedback through Facebook and their YouTube channel. For some, dai pai dong means no air conditioning, poor hygiene and servers with attitude. 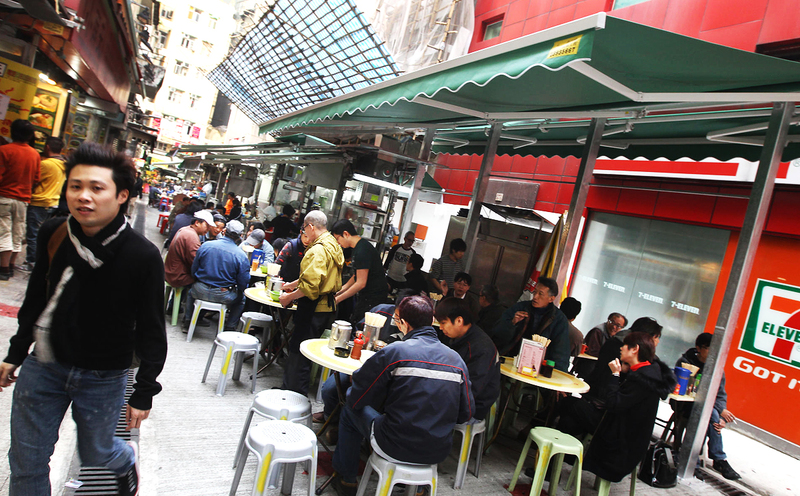 But fans still make a beeline for the old-style open-air food stalls that deliver tasty, affordable, made-to-order dishes, often using traditional Cantonese recipes. Here are some favourites recommended by foodies and online reviewers. Description: ​​#RobertReviewFoodAndDrink​ is Robert Chaen’s independent, insightful, truthful review and critique on Food & Drink.